Striking the right balance between casual and formal can be viewed as an art. 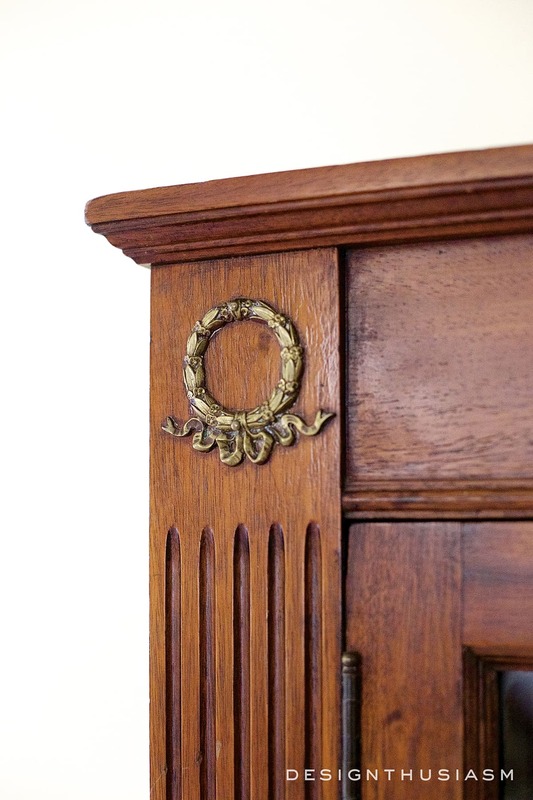 In my home I’ve collected some classic antique pieces which can take on a very formal look. While my design sense is decidedly European inspired, my lifestyle is distinctly casual American, so when I’m afraid a room is becoming too uptight, I know it’s time to tweak a few things. Using farmhouse touches to relax the formality of your home is a trick I’ve come to rely on to bring things back in balance. 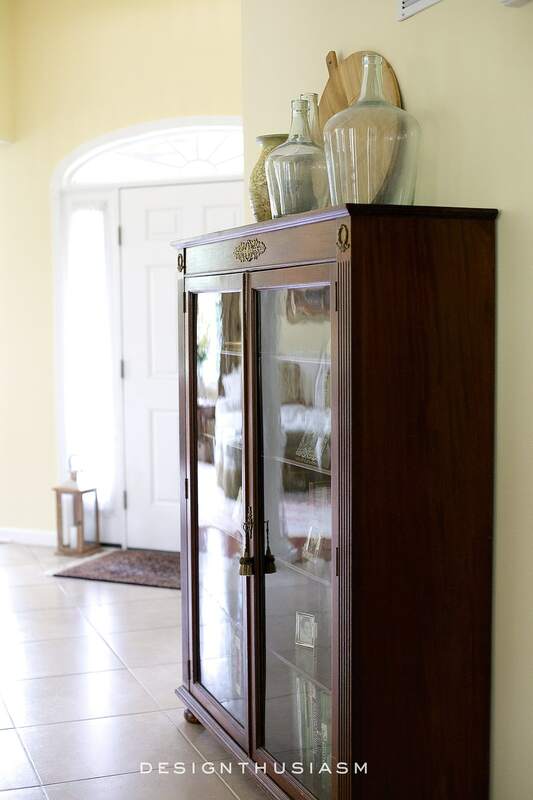 In my front entryway, I have a French burled wood bar server under a gilded mirror, set across from an antique glass front bookcase. The pieces are lovely, but can appear both heavy and a bit “buttoned-up”. While I would not classify my decor as farmhouse, borrowing a few details from the popular style can go a long way in lightening up the tone. 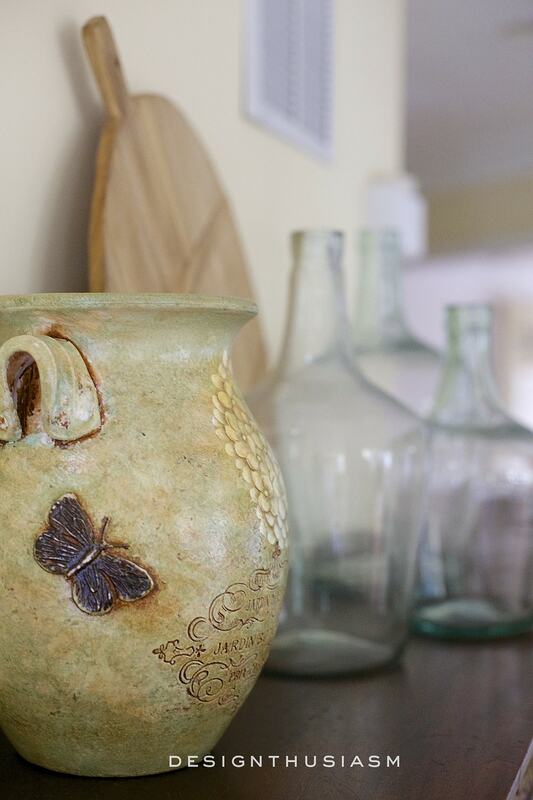 Farmhouse mixes well with my French Country aesthetic and helps add the patina that I so admire. 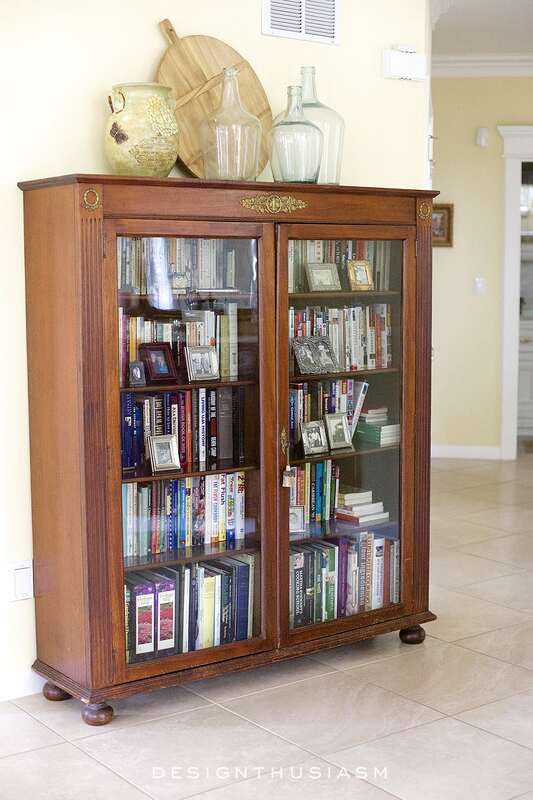 The bookcase is a relatively simple piece, but it has pretty brass trim that adds feminine French detail. 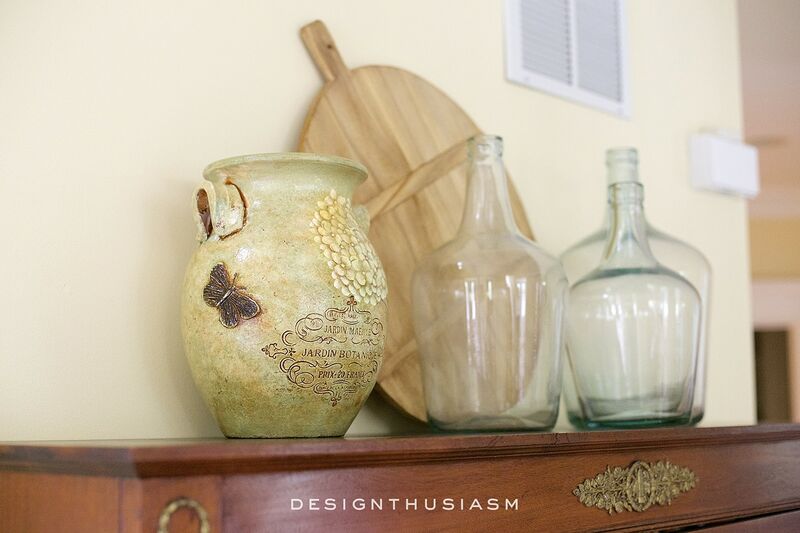 It could easily be dressed up for a more formal presentation (think leather bound books and chinoiserie urns), but for summer I decided to add a vignette with a much more informal vibe. 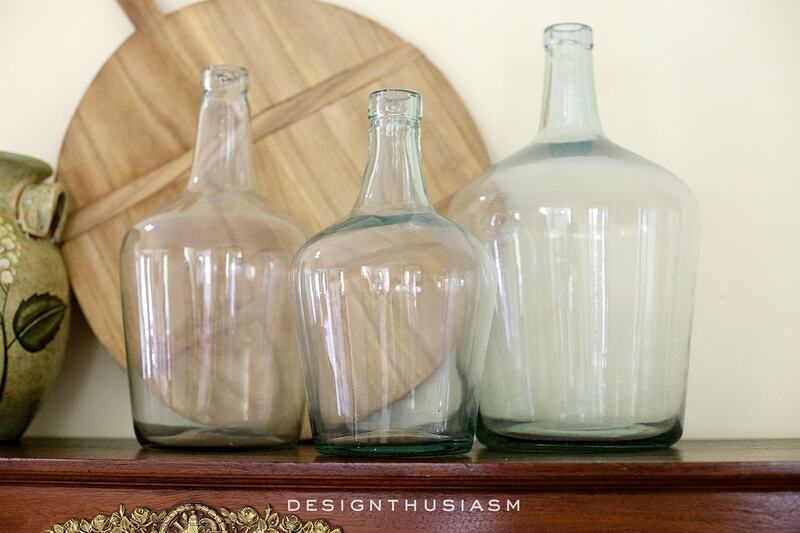 The key to the vignette is a trio of demijohns, a quintessential farmhouse accessory. I’d love to have the bookcase filled with antique books with beige covers and yellowed pages, but I actually use this bookcase for books I genuinely read, including my extensive collection of travel guides, so I’ve added a few vintage photos in front of the newer books to deflect the eye away from the lacking cohesion. 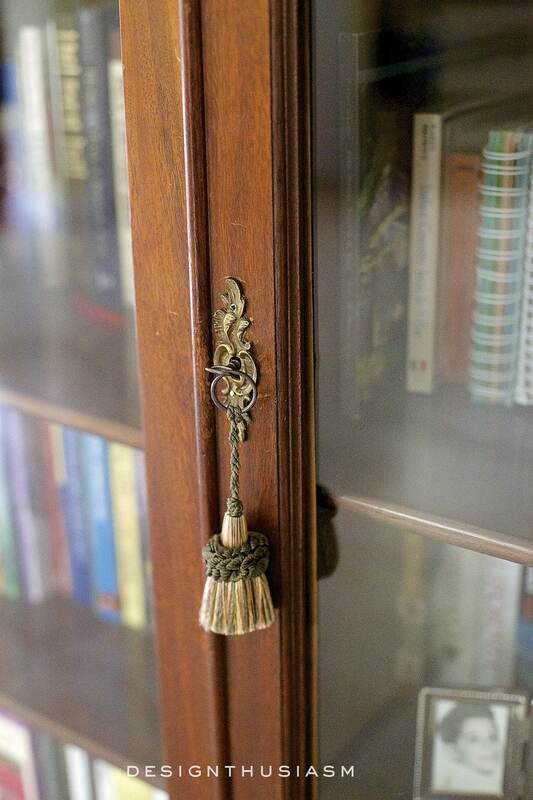 The decorative key plate is another brass touch that hints at the bookcase’s provenance. The warm-toned tassel was added for softness. 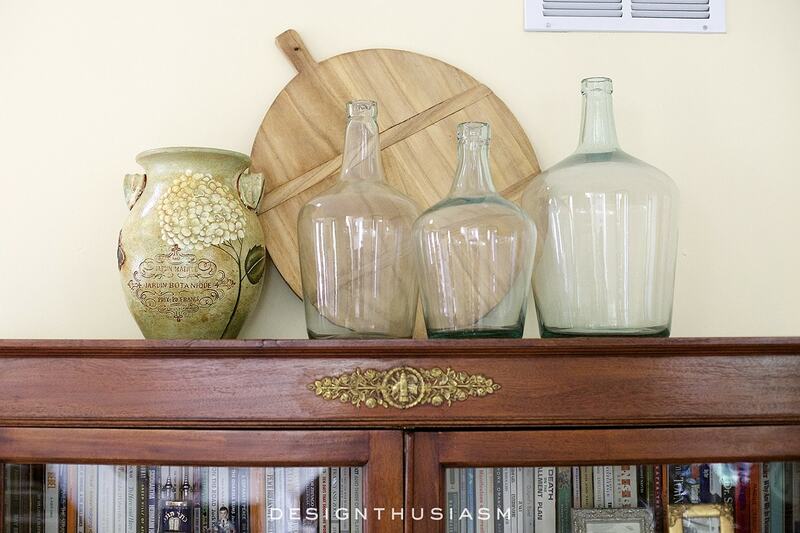 Joining the demijohns atop the bookcase is a Tuscan vase from Pier 1 Imports (see below for link). As large and dark as this piece is, it doesn’t look too heavy due to the light streaming in from the doors and windows that open to this foyer. 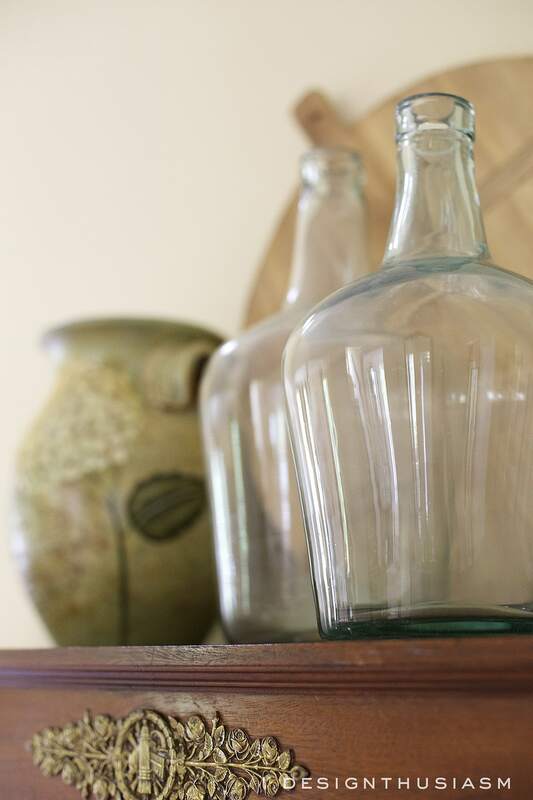 The demijohn trio is, in fact, not vintage and was bought recently from Antique Farmhouse (see below for link). Peeking behind them is a wonderful bread board that is also a reproduction. 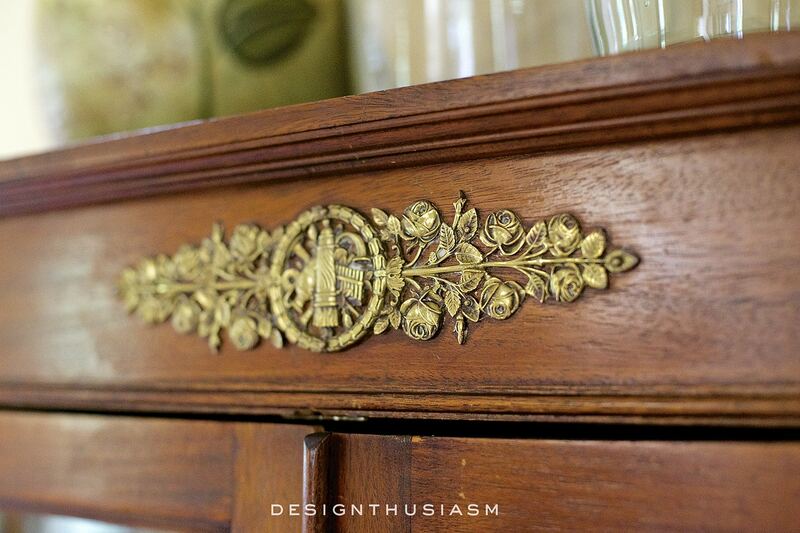 The vignette coloring was inspired by the brass floral trim, warm toned and golden against the rich dark wood. 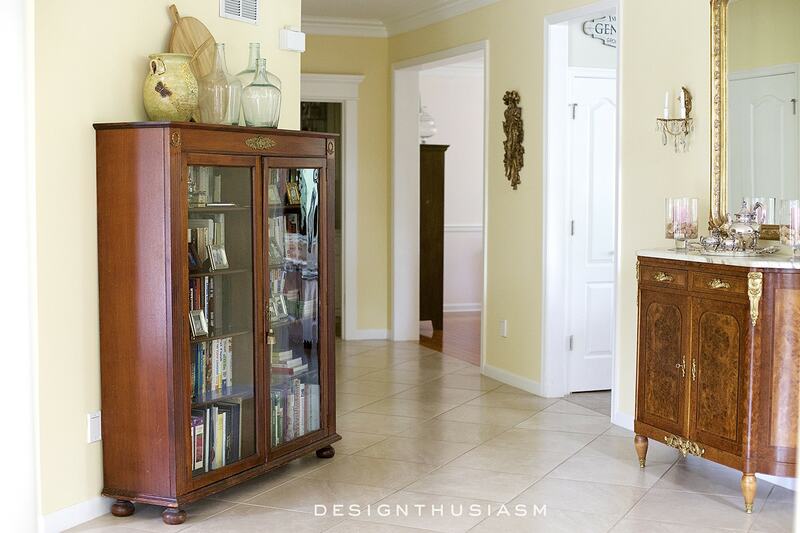 The French bar server sits across from the bookcase, with marble top and gilded trim. In a strictly formal setting it would look very serious, but my hope is that its surroundings keep it from getting too stiff. What do you think? Both of the antique furniture pieces were bought in Lambertville, NJ. Lory, your vignette is so pretty on the bookcase. Love your demijohns, with the bread board. It is a great balance for your french bar. I love your bookcase and especially the brass trim! It does make a nice contrast with your French bar. Thanks, Judith!! I was initially afraid to use so much wood in the entry, as opposed to adding some seating, but this seemed to fit best, so we went with it… 🙂 Thanks for visiting!! Lory, love your vignette. Your entry looks beautiful!!! Lory, to my mind, it is exactly your kind of decorative juxtaposition that make a beautiful space feel like a home and not a set design from a period play. Love your design aesthetic which makes yours one of my very favorite blogs. I know I’ll always see something I may want to emulate in my own home. LOVE the look. I prefer to use my bookcases for the books that I actually read, as well. It can be a decorating challenge – but I feel I have to surround myself with the things I love for my house to be a home. 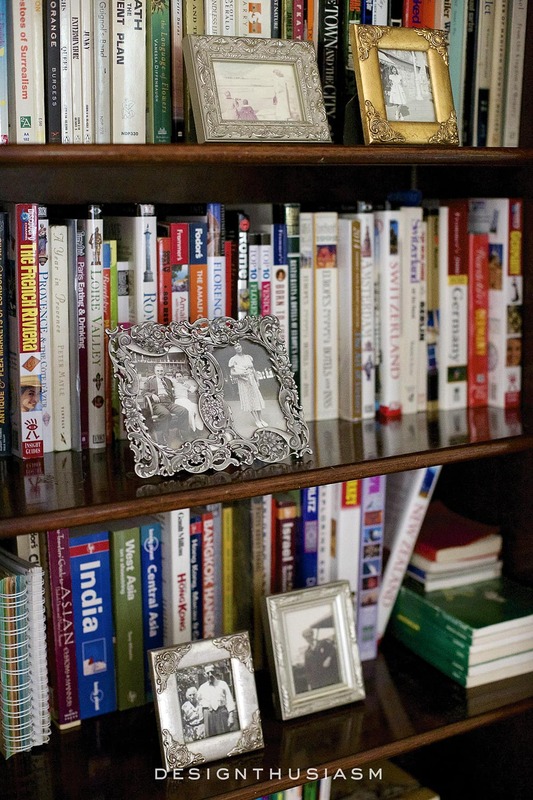 I also put framed photos in front of my books. Hey, it works! Always a treat seeing your home! Lovely! Can you share where the breadboard came from? Thanks!